In 1968 the fabled Motown Records Corporation was enjoying a creative and sales zenith in a manner unmatched by producers of hit singles before or since. According to Billboard Magazine's year-end issue, one half of the label's hottest selling act for the year was Philadelphia's Pop and Soul singing sensation Tammi Terrell. Legendary Marvin Gaye provided the second half of the torrid duo. With their massive and enduring hits like "Ain't No Mountain High Enough" and "You're All I Need To Get By" Tammi Terrell was nearly as famous for her stunning beauty as she was for her amazing vocal abilities. A gifted pianist as well, the effervescent Tammi approached her craft as a true artist. Born Thomasina Winifred Montgomery in Philadelphia on April 29, 1945, she started performing professionally at the tender age of 12. Entertainer Lola Falana and Alvin Ailey dancer Judith Jamison were counted among her many close friends in Philadelphia. It wasn't long before organizers insisted that the budding superstar could no longer compete in her age group when entering talent contests. She was just too good. Even in adult categories Tammy Montgomery, as she was then known, usually dominated. Adult singers frequently quit competitions when pitted against her. Tammi scored her first recording contract at barely 15 years old. Securing only regional notice, her very first recording "If You See Bill" is still considered a brilliant showcase for her impressive talent. She would experience her first modest national chart appearance still as Montgomery a couple of years later produced by superstar James Brown. 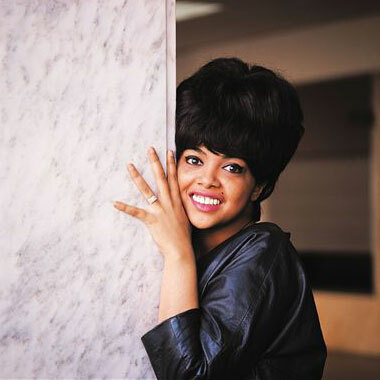 Following another brief stint on Chicago-based Chess Records subsidiary Checker, Tammi Terrell emerged in 1965 as a solo act on Motown Records. She became widely known in soul music circles after charting with her first two releases under her new name, "I Can't Believe You Love Me" and "Come On And See Me". In 1967, paired with Gaye, Tammi became an international superstar. In addition to her previously mentioned pop classics, she went on to record other revered smashes including "Ain't Nothing Like The Real Thing" and "If I Could Build My Whole World Around You". Sadly stricken with an incurable cancerous brain tumor, Tammi Terrell died in Philadelphia at 24 years of age on March 16, 1970 following a brave three-year battle. Her funeral attracted thousands and was the largest ever held in the City Of Brotherly Love up to that time.